Then filter the water completely from soaked Idli rice and grind by adding water little by little. Grind it till smooth or slightly coarse. It took approximately 1.25 to 1.5 cups of water for the rice to grind smooth. Transfer the rice batter to the same vessel urad dal batter is transferred and add required salt. Mix well with your hands. Let it ferment for overnight or at least eight hours. Next day the batter should be raised as shown (right hand side image). Now you can start make idlies using the batter. 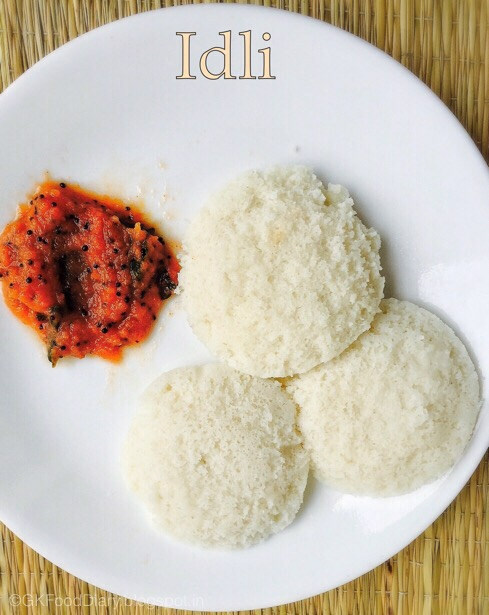 Heat the Idli pot with one cup of water and fill the mould of idly plate with batter. Steam it for 8 to 10 minutes. Then unmould the idlies from the plate. For dosa's add little water to the batter. Heat a tawa, spread the dosa thin in circular motion. Cook it for 3 to 5 minutes. Once done flip the dosa and cook it for 2 more more minutes. Remove from the pan once done.